As far as bad guys in franchises go, they don't get much better than Bane. The "Dark Knight Rises" villain is a former member of the League of Shadows; his iconic mask and garbled voice have inspired cat videos all across the Internet; and, of course, he has an affinity for hanging out in darkness. But is that all he's about? That's right, Gotham. 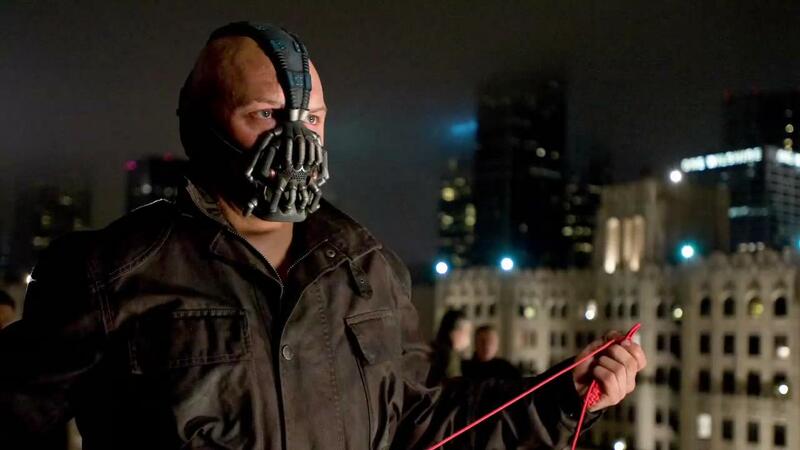 Just like your grandmother and people who make their own clothes, Bane enjoys the fine art of string work. He probably even has a Pinterest account to get ideas for new projects. How fun, right? It's easy to miss when it happens, but you can clearly see him playing with rope or string during the movie, perhaps knitting or crocheting. Comment from discussion Easter eggs in Dark Knight Rises?. Granted, everybody needs a little "me time" now and again, but it seems pretty out of place for someone set on destroying a city to all of a sudden have a penchant for arts and crafts. There's actually a major reason why this is in the movie, which Warner Bros. confirmed to HuffPost Entertainment, and a little background on the film finally reveals the truth. It can be argued that Defarge's knitting represents a couple of different things. In the story, she literally knits a list of condemned names into her work, but some say it's also meant to symbolize the callousness with which she carries out her treachery. Defarge performs her seemingly innocuous activity while sentencing people to death, which is exactly what Bane is doing in the courtroom. The similarities between the characters don't stop there. Defarge has had terrible wrongs committed against her and her family in the past and believes innocents should die for their families' crimes. Sound familiar? Warner Bros. confirmed the Easter egg to HuffPost, saying suspicions that Bane's apparent knitting is a reference to Defarge are "accurate." The company chose not to elaborate further. So there you have it. And for anyone who questions his unusual hobby, just think who's going to be laughing when you're freezing to death in Gotham's nuclear winter and Bane is nice and toasty in a brand-new, handmade pair of mittens. Appearing in almost every Pixar feature film, The Pizza Planet Truck, first spotted in "Toy Story" and shown here in "Wall-E," is one of the most ubiquitous yet hardest to spot of Pixar's many easter eggs. Eagle-eyed viewers may have also seen it in "Brave."